A classic silhouette with a twist. 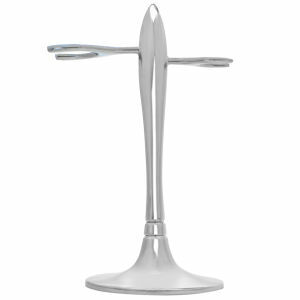 eShave T Shaving Stand two arms stand at different heights to hold both an eShave razor and shaving brush while displaying their beauty. eshave T Shaving Stand helps maintain your shaving brush by hanging it hair down, after use to dry. Your stand also holds the razor in a safe hygienic place. Eshave Shaving Stands are hand scuplted, rust and tarnish proof. To clean your stand use glass or silver cleaner and a soft cloth. Hand scuplted, rust and tarnish proof. * Please Note: Razor and Shaving Brush sold separately.